We can all agree that lawn dethatchers are indispensable tools for everyone who owns a house with a garden or a yard. However, finding the lawn dethatcher can become a daunting task, especially if you don’t have prior knowledge. Finding the best model that will serve your purpose is the most challenging part. There are numerous models on the market that are specialized for specific tasks. Therefore, choosing the lawn rack requires a prior research so that you can make a quality purchase. Some models are suitable for dethatching, have ergonomic features, flexible handles, adjustable height and other customizable features. The idea is to find the perfect model that will suit the size of your lawn. However, before we present you best models on the market, we will show you things that you have to consider before you purchase the best dethatcher. 2 When Should You Use Dethatcher? The best way to maintain and treat your lawn and grass is using appropriate power tools that will help you finish the job with ease. The essential aspect of lawn maintenance involves lawn dethatcher as the primary tool. Vertical mower or dethatcher is household power tool that uses vertical blades to cut through lawn’s thatch layer by loosening it up and bringing it to the surface. In some cases, you will get the possibility to adjust the blade so that you can accommodate your specific lawn and grass height. When Should You Use Dethatcher? People mostly perform dethatching in mid to late spring when grass is overgrowing and can recover as soon as possible. We recommend you to choose the point where the lawn is lower than usual so that you can moisten the soil surface during the operation. If you want to handle creeping grasses, you should set blades about an inch deep and apart so that you can cut into the soil with efficiency. On the other hand, you can configure blades farther apart and higher for bunching grass types. For stubborn and thick branches, some dethatchers have enough power to handle everything in one pass, while budget-friendly models require the second pass right after the first. By using that, you will be able to remove unwanted debris and rake up the soil so that you can use it all the time. Handle – The handle length can be long or short. Choosing short-handled dethatchers is excellent if you prefer to work in narrow spaces and on your knees. They are best for slicing weed because you will be able to draw tool with ease. On the other hand, models with long handles are best if you want to maintain a yard without stressing out your backs and muscles. At the same time, they are great if you have a big yard to keep. Durability – You should always consider the strength of the tool by checking the construction. It is simple to find out by checking the construction materials, wheels sturdiness and tin material. Entry-level dethatchers have a lousy structure, which will increase harassment during the operation. We also recommend you to consider whether the dethatcher contains protection against bending or not. Simple to use – The idea of garden power tools is to make the process as simple as possible. Therefore, you should find the dethatcher that is simple to use. In case that you have issues with knees or back, it is always better to choose the model with a long handle. Simple to maintain – It is essential to clean and maintain the dethatcher after each use. Some of them require additional maintenance such as extra care and lubrication. Always consider rust-free materials so that you can store the tool with ease. Cost and Efficiency – Before you make a purchase, you have to find the perfect design that will help you maintain your lawn and specific grass that you have on it. Therefore, you should check if you have only grass or wide array of weeds. It is essential to consider safety factors so that you can prevent any serious injuries and accident. It is always better to choose the latest model with advanced technology. On the other hand, if you have a limited budget, that will narrow your search. If you want to see the tool that can easily tow behind dethatcher, we recommend you to consider Greenworks 27022 corded dethatcher. A handy tool will protect and keep your lawn and beautiful. It includes stainless steel tines that will increase the reliability and durability of the tool. At the same time, durable material is entirely rust-free so that you can store it with efficiency. Apart from the construction material, it is quite comfortable to use due to the padded bale switch and grip. It is a simple-to-use tool that will provide you an effective and efficient way of ridding the nasty thatch. It includes a slew of moving vertical tines so that allows you to pull the thatch from the soil in a matter of seconds. Due to the pure push starting, you can rest assured and enjoy fast starting without the hassle of starting cord. It includes user manual that will provide you all details you need on how to use the machine efficiently. It works on the 10-amp engine, which is not the most powerful one in the category, but perfect for small sized lawns. It contains three-position tine-depth so that you can enjoy with additional versatility. The handle is easily operated, and it folds efficiently so you can store or transport it after the operation. In overall, Greenworks 27022 corded dethatcher is an excellent solution for everyone who wants the dethatcher with adjustable cutting tines, 14-inch dethatching patch and decent 10-amp motor. It includes durable construction with stainless steel that means many years of serving. The best way to keep your lawn trimmed is by using Sun Joe AJ801E electric dethatcher. It is one of the best-rated dethatchers that you can find on Amazon. The main reason for its popularity is the 12-amp electric motor that powers this electronic power tool. The engine makes the performance highly dependable when it comes to the combination of speed and runs time. The 13-inch grass-cutting path is an excellent solution if you have a small to the medium lawn to maintain. You will be able to finish more work in a single pass than other dethatchers on the market will. It features Airboost Technology that will maximize the pickup so that you can make reliable, comfortable and super fast results. Due to Airboost Technology, spring steel tines will stay sharper and provide the fantastic performance. It includes five-position depth control so that you can work at various heights. It starts from -0.4-inches to 0.4-inches. Finally, you will be able to control the depth based on your specific needs. By purchasing Joe AJ801E electric dethatcher, you will get compact and lightweight power tool that is handy to store with convenience. The scarifier feature will give you the possibility to cut the grassroots as the result you can increase the quality of turf. We all know that having a beautiful home is not just about hard work, especially if you have the right equipment to use. That is why you should consider Sun Joe Dethatcher Joe AJ800E grass dethatcher. It features 14-inch cutting edge, which comes in warm and fresh green color and steel deck for additional durability. It includes 5-position depth control so that you can adjust it based on your lawns needs and preferences. Due to the new handle, you will be able to push up to 11.8-gallon thatch catcher that you can detach in a matter of seconds for quick disposal. There is a stop and start buttons on the handle, and everything runs on 7-inch polymer wheels. The design is great because it increases maneuverability, ease of use and efficiency. It runs on electricity and features an 11-am engine that can reach up to 3600 RPM. It includes sufficient start-up power that will provide you efficient and long-lasting performance. It is simple to use, you will need an appropriate power outlet, and there are no limits. It uses Airboost technology system that will increase mulching and raking features. At the same time, due to 24 steel tines, you will get reliable performance and long-lasting sharpness. It doesn’t require gas or oil, and you will only need to press a button to start or stop. Agri-Fab 45-0295 tine tow dethatcher is a great solution if you want to use the dethatcher that includes no-height adjustment. That will give you the possibility to use it without back strain and fatigue. In case that you have back problems and you want to maintain the small garden, we recommend you to consider this particular one. We also have to mention that it is one of the first electric dethatchers on the market, which is a way better solution than any gas powered dethatcher. It is comfortable to use due to ergonomic grips that are cushioned. You will have a great experience when it comes to comfort, which is one of the reasons for its immersive popularity. When compared with other dethatchers on the market, it is much faster in both dethatching and shifting features. The weight tray has 48-inches, and it can hold up to 70 pounds, which is excellent for thatching. Pneumatic tires will help you use it on rough and uneven terrain without too much hassle. In overall, Agri-Fab 45-0295 tine tow dethatcher is perfect for people who have small yards and want to keep them maintained. It is very comfortable and fast, and what is most important, you don’t need any physical power to run it. If you want to find the push dethatcher that will stand the test of time, we recommend you to consider Brinly DT-48BH tow behind dethatcher. It is an excellent solution because to keep your lawn maintained maintained without too much hassle. It includes six brushes so that you can provide the maximum debris pickup. Due to the 42-inch sweep and possibility to hold up to 20-cubic hamper, you will be able to finish the job in a few passes. 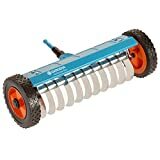 It contains two rows of flexible tine tips that will comb the lawn in a matter of seconds as well as extracting thatch and place it on the surface. Afterward, you can mulch it by mower blades or use lawn vacuum to clean everything. The great thing about it is the possibility to adapt to all tractor hitch heights. It has inline wheel design so that you can store it without using too much space. It includes 24-3/16-inch diameter triple coil strength steel tines that will provide you maximum durability, efficiency, and thatch removal. Due to heavy-duty 14 gauge steel tray, it can withstand additional weight during the operation. The transport wheels are behind and utterly in-line with tray so that you can facilitate leveling without any further problem. 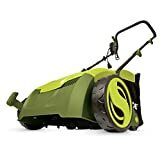 If you want to choose best lawn dethatcher that includes an innovative design that will maintain your lawn with ease, you should consider Wolf-Garten URM Scarifying roller rake. Finally, you will be able to make your garden healthy and tidy, without too much hassle. It is perfect for clearing thatch, moss, old grass clippings and other debris from your lawn. As soon as you remove the yard from thatch, it will receive better sunshine, air, water, and that will make it healthier than before. It includes wheels so that you can push it around. Storing due to the convenient design is simple. It contains 10-robust spring-steel tines that will cut through any grass and soil. It is an efficient tool for seeding preparation, and it functions through push/pull system to dethatch. Within the package, you will get the possibility to enjoy it for years. It includes a 10-year warranty, which is another proof that it will stay in your household for a lifetime. If you want to purchase the machine that can easily maintain up to 1000 square feet of lawn, you should consider Agri-Fab 45-0472 electric plug dethatcher. Apart from the possibility to handle medium sized lawns, it includes no-tool height adjustment so that you can remove thatch without too much hassle. There are times when you have trouble with managing height, and if you touch hard soil, you can damage the machine. Due to the height adjustment, you can be sure that your blades stay safe during the performance. You have to turn on a switch, and you will be able to start it without the use of oil or gas. It is important to mention that you have to use 12-gauge cord extension, which is not within the package. One of the essential features of dethatchers is the possibility to use it with ease and added comfort. You don’t have to worry, because this particular one will give you comfortable experience due to cushioned grips that will reduce blisters and muscle fatigue. Gardena 3395 Combisystem is a straightforward and convenient solution if you want to take care of lawn by watering soil and removing unwanted debris. 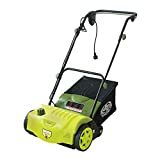 This particular one is great if you have a small garden because it is manual and perfect for light work when it comes to gardening tasks. 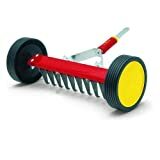 The idea of the manufacturer is to provide you reliable gardening equipment for the affordable price tag. Of course, it lacks features like any best thatching rake that you can find on this particular list, but it is reliable if you have time and strength to work with it. By saying that it is reliable for light-duty work, it implies that you won’t be able to work for the extensive amount of time without getting muscle fatigue. Of course, that is the option if you have enough stamina, strength, and agility, but have in mind that manual dethatching is heavy-duty work. It requires less effort than low-end dethatchers do because it includes supporting axle in combination with a wheel that will provide you additional convenience. The durability is the reason for its popularity and amazing 25-year warranty that you will get by buying it. If you want to choose compact and straightforward to use dethatcher, you should consider Ames 2915100 best rake dethatcher. 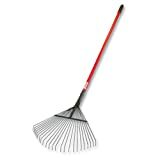 The first thing that is important to mention is 15-inch self-cleaning rake head that can quickly clear everything in a single turn. According to the manufacturer, it is all-purpose lawn rake, which includes curved tines that are perfect for clearing thatch or dead grass clippings. This will increase the look of your lawn and provide the better overall impression of the entire house. It is comfortable and straightforward to use, which means that you will be able to handle it for hours without any additional hassle. 10-inch end grips will increase control during the operation and comfort because handles are cushioned. The price tag is entirely budget-friendly, and keep in mind that warranty deal is 15 years, that says something. It means that you will be able to use it for a lifetime without any additional problem. 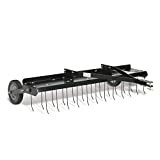 In overall, Ames 2915100 best rake dethatcher is an excellent solution for people who have small to medium lawns and want them well maintained and prepared for the season. Mantis 7321 Power Tiller Dethatcher is one of the most popular lawn care attachments that you can purchase for the affordable price tag. It includes innovative design so that you can use it for heavy-duty performance. It features folding handlebars so that you can store it afterward with convenience. It is perfect for clay and compact soil, but it doesn’t have enough power to handle thick soil as other dethatchers that we have mentioned above. It includes 15-inch swatch so that you can finish everything in a single pass. Due to 4-sets of tempered steel blades, you will get peace of mind and possibility to complete most work promptly. The overall construction is quite lightweight, and it weighs only 24 pounds so that you can move it with ease. 60-spring steel pick dethatches a great addition to features so that you can ensure its versatility. It uses 25cc motor, and it is a gas-powered solution, which is much more potent than any other best electric dethatcher is. The main disadvantages are harmful emissions and loudness that you will experience during the performance. For people that have large lawns, the best solution is to purchase the best tow behind dethatcher. However, if you have a small garden that demands regular maintenance, it is way better to choose Bully Tools 92312 Leaf and Thatching Rake. It is an excellent solution due to high-quality construction that includes extra-thick, commercial-grade steel. It also contains durable steelhead as well as fiberglass handle that are both durable and lightweight. Fiberglass is an excellent material because it tends to resist breakage; while on the other hand, it is simple to use and lightweight. By purchasing this particular rack, you will get durable construction in combination with a lifetime warranty. In overall, it is much better to purchase Bully Tools 92312 thatching rake than any other type, especially if you have a small lawn that you can maintain in a matter of hours manually. This particular rake is one of the toughest on the market, due to spring steel tines that can quickly pick up heavy-duty debris and river rock. We have presented you thorough dethatcher reviews and the buying guide. The main idea is to collect all information that we have presented to you so that you can make your own decision. As you can see from everything that we have mentioned above, various models are great for certain lawn types. Buying dethatcher is the investment that must pay itself off, that is why you should consider any electric yard rake or gas-powered alternative that will handle your preferences and plans.